"W﻿hen I want to travel with the essentials ﻿on my back and the open road at my feet I use ﻿﻿my ﻿﻿Farpoint 40"
In Summary: This is my Osprey Farpoint 40 travel backpack review based on my own experience of over 2 years traveling with the bag and using it as carry on luggage. I have traveled extensively carrying all my belongings in a Farpoint 40 and I regularly write about traveling light and test carry on luggage and travel accessories. So I feel well-qualified to write a fair review of this product. Size & Comfort - 40 liters is a great size of pack for carry on luggage and larger backpacks risk being uncomfortable to carry. Value - the Farpoint isn't too expensive for what you get. Practicality & Features - the farpoint has lots of pockets, zips and padding right where you need it. It opens up fully like a suitcase and is easy to pack. Down sides are few but some of things people don't like are the logos on the bag, the colors and the fact that the laptop compartment is on the outer side of the bag rather than against the back. Before we go in-depth about the Farpoint 40 I want to first consider what makes a good travel backpack. The first thing to consider is why go with a backpack at all? Why not a suitcase with wheels? Travel backpacks really come into their own when you are dealing with staircases, uneven surfaces and public transport. If you will probably spend some part of your travel sightseeing or kicking around town with your luggage in tow then a travel backpack is the best option with one caveat — your backpack must not be too heavy for you. You need to be fit and strong enough to take the weight you want to carry. If you can't physically handle the pack on your back then you'd be better with a rolling suitcase.​ A travel backpack won't be convenient or pleasant if your back is aching and you are sweating buckets! One way to help with this is to adopt a packing and travelling light philosophy like I encourage CarryOnGuy.com readers to try. ​If you will be flying, and this review assumes you will be, you also need to consider carry on luggage size restrictions. The top limit that is sensible for a carry on backpack is 45 liters and 22 x 14 x 9 inches. I also feel that this is around the limit for what is sensible to carry on your back anyway. 80 liter hiking backpacks are only suitable for physically strong types that are carrying a lot of hiking and camping gear. With the correct planning you should not need to take a huge backpack stuffed full of clothes. So I would always advise looking at travel backpacks that are not larger than carry on size. Is it under the carry on luggage size limits? Is the bag itself lightweight? Does it have a hip belt? Is it easy to pack and unpack? Are there outer pockets for access to travel documents? Will this last? Is it well made and durable? Osprey were founded in 1974 by Mike Pfotenhauer so this is a company that has been around for a long time. You simply don't stay in business for more than 40 years if you are not making great products. 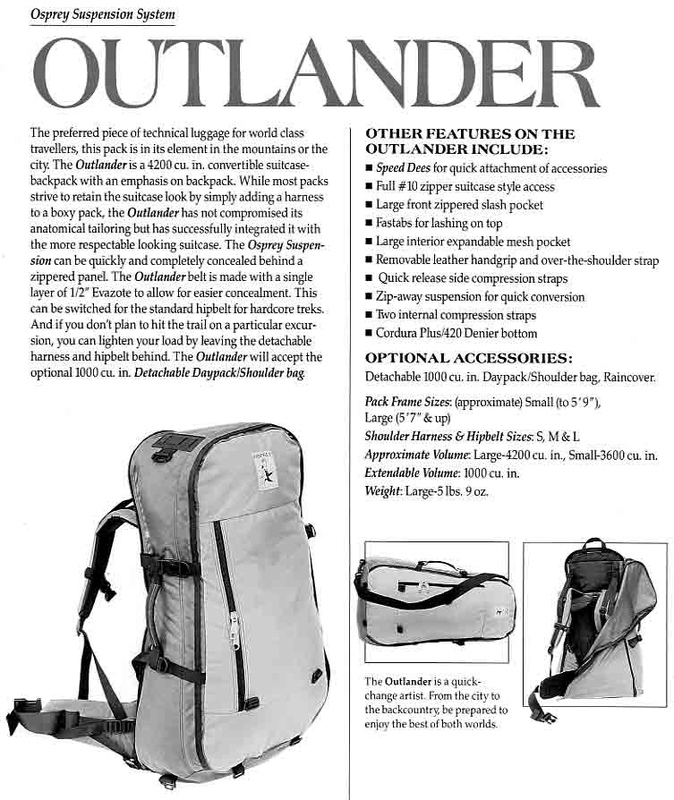 And Osprey have been making travel packs since back in 1979 continually refining their craft and I guess the Outlander pictured below is the grandfather of the current Farpoint range. The Farpoint 40 is designed to be have the comfort and freedom of a hiking backpack but the ease of packing of a suitcase. It's designed to be equally at home up a mountain or stored in the overhead bin of a plane. I love it! And the next section will explain why. The Farpoint 40 has ideal carry on dimensions so that you can take it with you in the cabin on most airlines. You shouldn't have any problems with this pack on most flights but it's always sensible to check. This makes it a great option for international travelers since it should be carry on size all around the world. For example Ryanair in Europe has a depth limit of 20 cm or just over 7.8 inches. 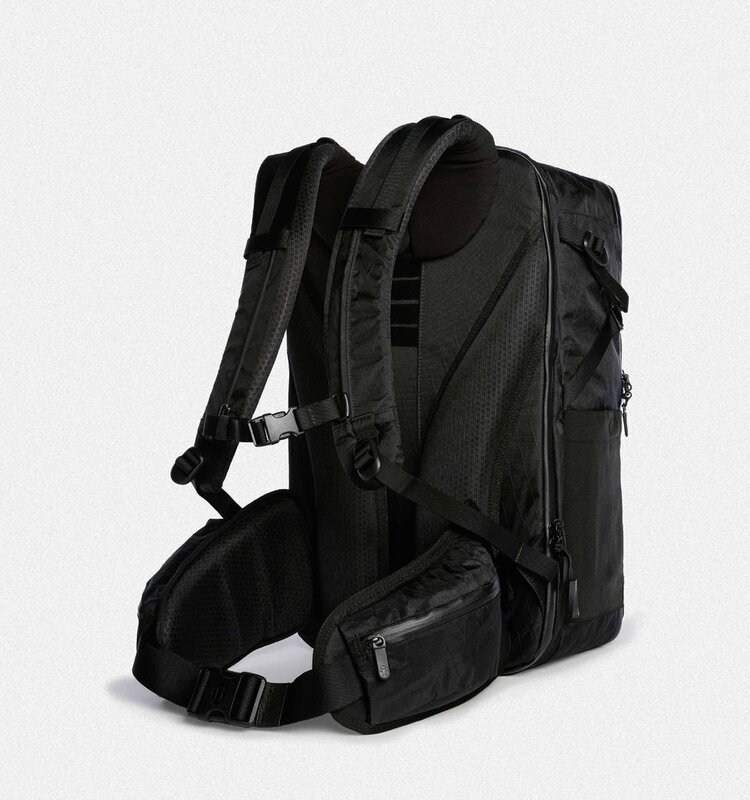 Usually with a standard size rolling carry on you'd be screwed but with a travel backpack like the Farpoint 40 you just don't pack it so tight and it will squeeze down to under even strict limits no problem. One thing that I love about the Farpoint 40 is that it is slightly less than the maximum size for carry on luggage.​ I know a lot of people think that the maximum size is best but it's not. If you are carrying on your back it's actually a good thing to have some constraints. Osprey have struck a good balance with their 40 liter size. It opens up fully so like a suitcase so that it's easy to pack and their are internal compression straps to help you squeeze your clothes down to a smaller size. There is also a large mesh pocket in the main compartment​ to help organize your things. If you wanted more organisation you could get packing cubes or do what I do and separate out things with clear plastic food bags. They are lighter than packing cubes anyway! For example I keep my t﻿﻿ravel coffee maker and some coffee in a clear plastic bag. The straps and the hip belt can be stored away which effectively turns the Farpoint into a duffle bag. They even provide a removable shoulder strap so you can carry it over your shoulder like a duffle. Also, most of the time I keep my backpack straps out but roll up the hip belt and stuff it away since I don't use it. It's possible to do that too and I like to not have too many straps flapping around. The Farpoint 40 comes in two sizes the small/medium and the medium/large. There is not a huge difference in capacity between them. It's more about the height of the wearer so that the hip belt actually sits on your hips. The torso size for the large is 18 - 22 inches and 15 - 19 inches for the small. ​So roughly shorter people under 5'9" should choose the small/medium and taller people above 5'9" should choose the medium/large. The large version is 3 lbs. 2.7 oz and the small version is 3 lbs. 1.75 oz. Osprey have clearly paid used lightweight materials where possible to keep the weight down and it pays off. There doesn't seem to be any downside in terms of durability from using lighter materials. If you do any hiking on your travels then you will love the Farpoint because it's actually a comfortable hiking backpack too. The zippers are fantastic. They have loops that make it really easy to open and close the bag and the zips have never failed or got caught in all last 2 years of using the bag. And they are lockable if you buy a padlock! You need to undo the compression straps to unzip the pack and if you don't use them they flap around and get in the way at times. Of course I could have solved the problem by just cutting the compression straps off... but I didn't do that because they are actually awesome when you need to compress the pack to fit a size limit. So overall this negative is still a positive. The laptop compartment is on the outside of the pack. It's usually a good idea to pack your heaviest items closest to your spine but the design of the Farpoint 40 does not allow that. However since I use a Surface Pro as my main laptop and that's lightweight it's not really a problem.​ But I should point out that the Farpoint 40 works better with lighter laptops. Some people think that Osprey have over done their logos and branding on the bag. Personally I think it looks great and I don't really care what people think anyway. I'm more concerned with how the backpack performs that how it looks. Who's Using The Farpoint 40? There are lots of people out there using the Farpoint 40 and sharing their experiences. Here are a few of my favorites from YouTube and we are all singing from the same hymn sheet. Marcus shows us some Farpoint 40 packing tips using packing cubes and some other accessories. It's amazing how much Daria can fit into her backpack. I especially like how she has customized her Osprey backpack by covering up the logo with a sewn on patch. Charles shares his 10 months experience using the Farpoint as a travel backpack. He loves the Osprey for the same reasons that I do. That it's just the right size for a travel backpack. I've tested the Farpoint 40 side by side with the new Tortuga Outbreaker. Simply put the Tortuga Outbreaker is way too heavy. It feels heavy when you pick it up even when it's empty. At 5.1 lbs it's 2 lbs heavier than the Farpoint 40 and I don't think you gain a lot for the extra weight. ...the love you take is equal to the love you make. And I'm also a huge fan of the Osprey Farpoint 40. Not as much as I love The Beatles... but yeah I really really like this backpack. You won't need to sell a kidney to be able to buy one. It's ​just the right size, just the right weight, just the right price and just the right travel backpack for me. I just bought the Osprey Farpoint 40. Question – how do you hide the waist/hip belt, but leave the shoulder straps out? Thanks! Hey Diane ) The straps and hip belt have a zipped cover. I rolled up the hip belt in the cover and tucked it in at the bottom. It never fell out.